Doctors Hospital of Laredo is focused on treating patients with disorders of speech, voice, language, cognition, memory and swallowing. Patients may need these services as the result of having a stroke, brain tumor, neurological/post-neurological condition, neuromuscular disease, or head and neck surgery. Outpatient rehabilitation services are provided at the North Laredo Diagnostic and Therapy Center. 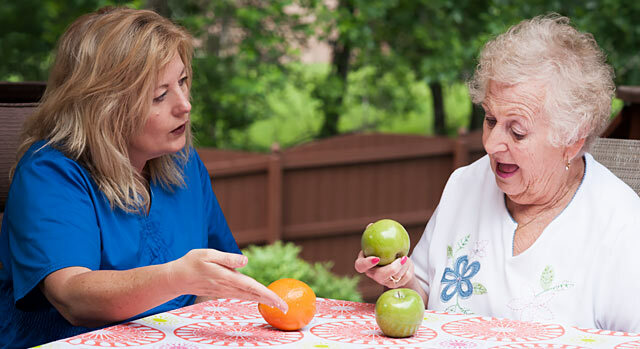 A treatment plan is created for each patient that is focused on re-establishing functional and reliable communication. Treatment goals may also address specific communicative-cognitive deficits through a variety of facilitatory and compensatory treatment techniques. Patients with swallowing disorders are seen for a comprehensive evaluation which may include a videofluorographic swallowing study to achieve safe swallowing. This is followed by swallowing treatment and diet modification as needed. The speech language pathologists at North Laredo Diagnostic and Therapy Center are certified in VitalStim Therapy and Lee Silverman Voice Treatment for individuals with Parkinson's and other neurological conditions. They are also trained in tracheoesophageal voice prosthesis, flexible endoscopic evaluation of swallowing, modified barium studies and instrumental voice evaluation. Outpatient services are available Monday - Friday from 8 a.m. - 5 p.m. If you need a referral to the speech and language pathologist or other physician at Doctors Hospital of Laredo, call our free physician referral service at 1-877-992-1711.